The image above is the Great Seal of the United States. 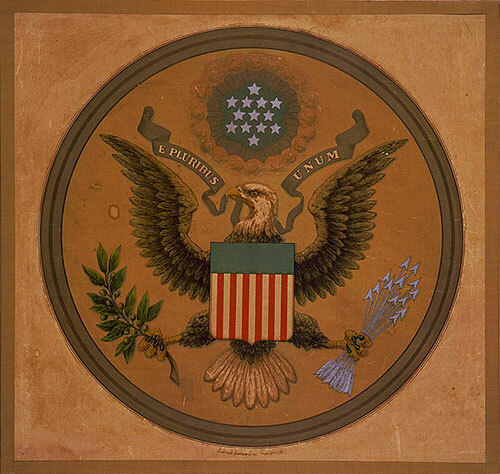 On the seal are the words "E Pluribus Unum," a Latin phrase which means one out of many. This phrase was initially suggested as the motto of the United States in 1776. It was meant to be the motto to unite the 13 American colonies as they became one country. The phrase was the unofficial motto of the United States until 1956 when a law established "In God We Trust" as the official motto. Although “E Pluribus Unum” is not the official motto of the country, the idea of unity permeates many parts of American society. The idea of unity also applies to the people of the United States of America. The identity of the United States includes the contributions of men and women from various backgrounds.